Spanish moss covered Live Oaks and fragrant flower filled Southern Magnolias are not the only tree species found at the City of Gainesville’s Evergreen Memorial Cemetery. 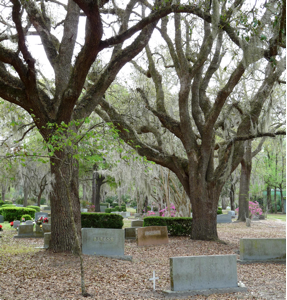 Sand Live Oak, Laurel Oak, Water Oak, Sweetgum, Hackberry and Pines… Longleaf, Slash and Loblolly… all grow on the cemetery grounds. Medium size trees like the Red Maple, Southern Red Cedar, and East Palatka Holly are also there. The native Sabal Palm can be found in several locations, as well as other non-native palm species such as the Pindo Palm and the Date Palm. Recently planted trees include Shumard Oak, Bluff Oak, Winged Elm, and Florida Maple. The flowering trees that give a show spring through fall include Flowering Dogwood, Redbud, Flatwoods Plum, and Crape Myrtle. This heavy tree canopy provide habitat for birds, squirrels, deer and many more animal species.